Evaluation Technologies for Food Quality summarizes food quality evaluation technologies, which include sensory evaluation techniques and chemical and physical analysis. In particular, the book introduces many novel micro and nano evaluation techniques, such as atomic force microscopy, scanning electron microscopy, and other nanomaterial-based methods. All topics cover basic principles, procedures, advantages, limitations, recent technology development, and application progress in different types of foods. 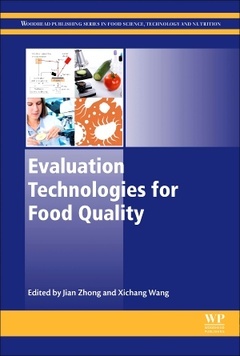 This book is a valuable resource for scientists in the field of food science, engineering, and professionals in the food industry, as well as for undergraduate and postgraduate students studying food quality evaluation technology. Part I. Food sensory evaluation technology 2. Food sensory evaluation methods by human senses: Principles of experimental design and statistical analysis to the use of human senses (sight, smell, taste, touch and hearing) for the purposes of evaluating different types of foods. 3. Electronic nose for food sensory evaluation: Principles and application of electronic nose for evaluating different types of foods. 4. Electronic tongue for food sensory evaluation: Principles and application of electronic tongue for evaluating different types of foods. 5. Electronic eye for food sensory evaluation: Principles and application of electronic eye for evaluating different types of foods.